President ("nasi") of the Sanhedrin in the latter half of the second century B.C. He and his colleague Nittai of Arbela were the second of the five pairs of scholars who received and transmitted the tradition (Ab. i. 6; Ḥag. 16a; see Zugot). At the time of the persecution of the Pharisees by John Hyrcanus, Joshua was deposed—a disgrace to which his words in Men. 109b apparently allude. 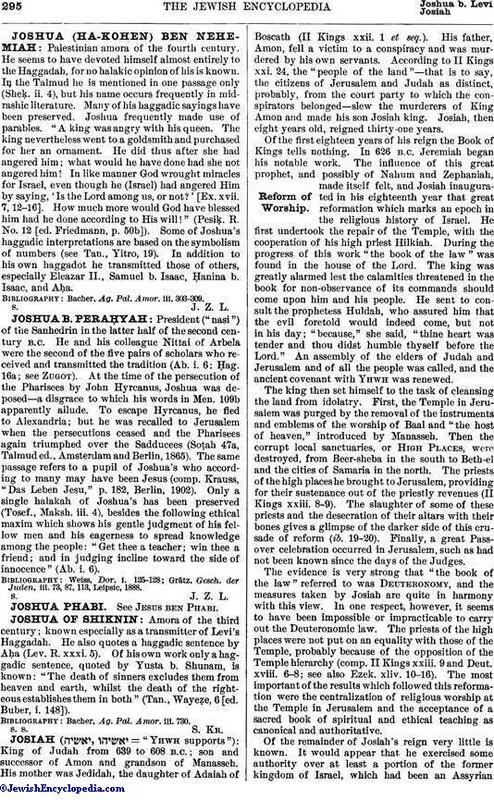 To escape Hyrcanus, he fled to Alexandria; but he was recalled to Jerusalem when the persecutions ceased and the Pharisees again triumphed over the Sadducees (Soṭah 47a, Talmud ed., Amsterdam and Berlin, 1865). The same passage refers to a pupil of Joshua's who according to many may have been Jesus (comp. Krauss, "Das Leben Jesu," p. 182, Berlin, 1902). Only a single halakah of Joshua's has been preserved (Tosef., Maksh. iii. 4), besides the following ethical maxim which shows his gentle judgment of his fellow men and his eagerness to spread knowledge among the people: "Get thee a teacher; win thee a friend; and in judging incline toward the side of innocence" (Ab. i. 6). Grätz, Gesch. der Juden, iii. 73, 87, 113, Leipsic, 1888.